Some video just posted on YouTube presents a reality many of us hadn’t considered before about the flooding in the Northland. It’s likely some things are never going to be the way they were before. Portions of some rivers and canals, in fact, are going to be in entirely different places than they were just a few days ago. 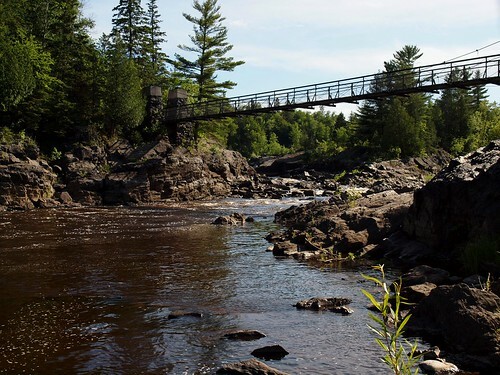 This video from Thompson, in the Jay Cooke State Park, is a perfect example. How do you fix this? Also posted today is this video of the famous swinging bridge in the state park. Whatever is left of it can’t last much longer. Duluth Flood 2012 Swinging Bridge Jay Cooke State Park HD 720p from Sparky Stensaas on Vimeo. Link for the overhead and you get a good picture of where the break occurred. The power of water never ceases to amaze and scare me. Thankfully, the USGS stream gauge at Scanlon shows the St Louis River is finally starting to drop below 16 feet. Hopefully the Swinging Bridge can keep holding on. Yup, John P. and never poke at the snake. Makes me wish that whoever engineered the swinging bridge had also engineered the Greenway bridge in south Minneapolis.